Comparing trinkets can be difficult, with each available at a range of different item levels. To make it a little easier, we’ll compare all trinkets at an easily accessible 370. Some trinkets have niche uses like excelling in single target healing, or offering a shield. We’ll address those below. You can read in-depth details on each of the Battle of Dazar’alor trinkets here, but they’re also in the tier lists below. These are my trinkets: X (400 ilvl), Y (340 ilvl), Z (415 ilvl). Which should I use? QE Live is an online app that’ll tell you which of your trinkets or Azerite Pieces are best. It has full support for sockets, tertiary stats and more and it’s free. BFA has more stat sticks than you can shake a… stick at. We generally prefer sticks with intellect main stat (like the Conch of Dark Whispers) over secondary stats (like Twitching Tentacle). They’re mostly worth the same amount of average stats over a fight but intellect trinkets have more of their strength allocated to static, consistent power which is desirable as a healer. When comparing two stat sticks you usually just pick whichever is higher item level. Stat sticks can be categorised as either on-use trinkets or random procs. On-use trinkets provide fewer stats but make up for it in power since they can be used at the same time as Revival, a big maximum-Upwelling-stack Essence Font, or just a high damage moment in the fight. Conch of Dark Whispers has a 25% uptime and gives you an average of 172 crit. Twitching Tentacle of Xalzaix has a 24% uptime and gives you an average of 270 intellect. Drust-Runed Icicle has a 40% uptime and gives you an average of 291 intellect. Lion’s Grace has a 42% uptime and gives you an average of 187 versatility. Dread Gladiator’s Insignia has a 50% uptime and gives you an average of 321 intellect which is overbudget and makes it a very strong trinket. Once upon a time it only procced off damage but this was recently fixed. Ignition Mage’s Fuse has about a 17% uptime and gives you an average of 138 haste. While the proc is active you’ll average 828 over the 20 second buff. Balefire Branch has about a 22% uptime and gives you an average of 178 intellect if you aren’t hit by anything. This is heavily underbudget and near-useless in any situation where you’re taking damage while it’s active. Save it for Mythic+. 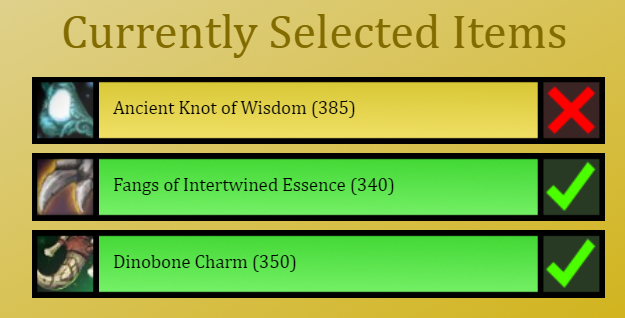 Ancient Knot of Wisdom has about a 33% uptime and gives you an average of 176 intellect (at its base ilvl of 385). This is quite underbudget and should be avoided. T’zane’s Barkspines has about an 11% uptime and gives you an average of 138 crit. Azurethos’ Singed Plume has about a 17% uptime and gives you an average of 134 crit. Dread Gladiator’s Medallion has about a 17% uptime and gives you an average of 138 vers. Healing Proc trinkets generally compete very well with stat sticks in lower difficulty raids and then start to fall behind as your HPS continues to rise. The amount of healing they give is fixed in that, overhealing aside, they don’t do more for you as your HPS increases in the same way that raw stats do. That means you can expect a Music Box to heal for about 14,500 per minute in both LFR Jadefire Masters and Mythic Blockade with only small variances due to overhealing. This doesn’t make them bad choices – they’re often quite strong – but it should be taken into account when selecting your trinket. They can still be potent, but it’s important to know how the underlying mechanic works. Lady Waycrest’s Music Box adds about 14,500 healing per minute (when you include crits, extra procs from haste and added healing from versatility). If you have the set ring you can expect some bonus DPS but no additional healing. Blizzard really likes stat sticks and healing proc trinkets but a few times per expansion we get something that doesn’t quite fit into either of those categories. Sometimes we get incredibly interesting and creative trinkets from it. Other times we get Inoculating Extract. Fangs of Intertwined Essence returns about 3282 mana per minute. This is equal to about half a Blessing of Wisdom and improves your natural mana regen by about 7%. Maximise the number of usages you get by using a weak aura to remind you or by macroing it into an ability. You’ll need to finish the fight with minimal mana to avoid wasting it. Memento of Tyrande (Black Temple Timewalking) procs 2.5 times per minute for a total of 1675 mana per minute. This is terrible compared to Fangs and is easily beaten by any other trinket of the same item level. Emblazoned Alchemist Stone is a hybrid trinket, offering both a stat proc (that averages 271 intellect) and a bonus to mana potions which is worth about 10,000 mana per fight if you use a Potion of Replenishment. It’s an amazing trinket because the mana portion isn’t included in the items budget at all. It’s as strong as a Tentacle of Xalzaix and then you get free mana on top of that, and you can just craft it. No relying on a rare drop. This is a $500 Pinot in a $6 bottle. Revitalising Voodoo Totem offers a stacking single target HoT on demand. The on-use heals for around 34,000 HP total for a per-minute average of nearly 23,000. This is a reasonable amount but it’s delivered in a clunky way since the HoT ramps up slowly (making it a poor emergency tool) and you give up stronger raid healing to equip it. Mistweaver single target healing is also already incredibly powerful. If it’s the best you’ve got then aim to use it on cooldown on a tank or debuffed player but you don’t want this. Inoculating Extract is like an incredibly clunky version of the Voodoo totem. It’s worth ~31,177 healing if you can use up all the charges for a per-minute average of almost 21,000. This is $500 of urine in a…. nevermind. Replace this as soon as you can with whatever you can find.